One of the rarest Air Jordan Samples has popped up on eBay. These Air Jordan IVs look very… ‘80s as they should seeing how they were a sample made in very limited numbers back in ’89. 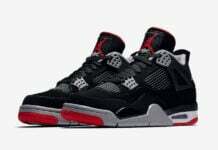 If you have never seen this pair before and assume they are fakes think again, click HERE to educate yourself on some Air Jordan history. Personally I have never seen this pair for sale, or at all for that matter, and even wondered if they had been produced at all. Please note that the seller found these grails at a garage sale and states he does not know if they are legit. My knowledge of Air Jordan’s is pretty extensive; these to me look legit otherwise I wouldn’t be posting this, though more pics would be nice. Check out his other items for sale as well, the guy has some heat in his closet and he is selling ALL of it! Even if you don’t plan on bidding, click HERE to take a look at what could be one of the rarest Jordan Samples on earth. Check out more images after the jump! The durabuck(black material) is clearly not 20 years old. If you look at any OG IV pictures, the material has an aged texture even visible in pics. The Biggest giveaway is the laceholder tabs. The gray color on them is exactly the same as fake IVs. It is a tad different from the color of the midsole. 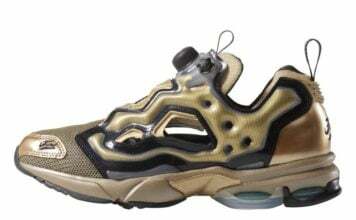 The overall shoe looks to be produced in the past couple of years, rather than 20 years ago. Sorry Matt but you could be mistaken. Not once, ever, have these been knocked off. Ive been collection forever and have studied up and down OGs, Samples, GR, QS and even fakes. These dont fit the bill of being knock offs. The durabuck looks good, this is bc they have very little wear on the shoe. The bad lighting doesnt help at all, but the sole and laceholders are yellowed. The overall look of the shoe looks to have been kept in great condition for the age of the product. The netting is placed perfectly and at an angle, not straight like the new aj4s and fake aj4s. 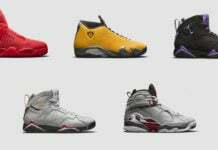 The biggest givaway is the lining on the toe box, it has the lighter gray/ almost white look to it, you know when Jordan used to use good materials that were not synthetic. But you may think what you want, the sellers feedback and other items for sale are all 100% legit and authentic… may say a little something for someone who obviously collects and has an image to keep up. They may be knockoffs, but chances are they arent. Ive seen OG Jordan 1s look brand new… 25 years old and looking as if they had been released yesterday. As I said, they could be knock offs, but that isnt what I think. The pic without the tags on the tongue is from air – jordans .com …. authentic sample pics. Again, think what you want. We will agree to disagree. The 13 bidders seem to think theyre legit. Im an OG head like yourself and agree that fakes are getting harder to spot in OG colorways due to poor quality and materials JB uses. Cant compair splatters… like cement print, not one pair are alike. Seller stated they are wearable not worn many times then cleaned…they are listed as pre owned/ worn due to the fact that they are obviously not DS. As the other poster said, no one knows for sure. However with that said, I’m 99% sure these are fakes. For one, OG IV laceholders do not yellow. Take a look at another pair of fake blk/cmnt IVs, you’ll notice the laceholder colors are dead on to these. The laceholder color is a much lighter color gray, almost looking transparent from afar. I’m more of an OG collector rather than anything new, and I find it much harder to tell fakes from authentics with the stuff the release these days due to the complete change in materials used and quality. I don’t mess with Player samples, or samples in general for that matter, but when it comes to OGs I know my stuff quite well. 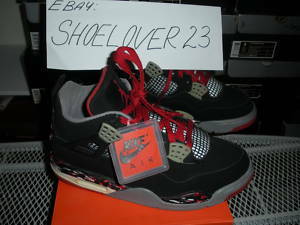 Seller also mentions “I’ve worn them a lot, then cleaned them,” and for anyone with some knowledge of Jordans they know that finding a wearable pair of IVs is very difficult to come by due to the polyurethane midsoles breaking down. For me, the biggest giveaway is just the shoes general appearance. I’ve spent way too much time scanning Jordan after Jordan over the years. Eventually, especially with IVs, it’s just a matter of general appearance. A: No I've worn them a lot, for short periods of time and cleaned the bottoms very well will oxyclean. The seller got one thing right, if they were truly authentic they would hit near the 5g range, and labeled as one of the rarest samples known. It's also been said on NT before that the listed pair on Air-jordans.com is not in fact a sample pair, but rather a custom. It's going to be a sad day for whoever drops $300 on those when they open them up. Decorating with a different gem thomas sabo jewellery accessory, shimmer, no minus than thomas sabo jewellery the form.To assemble the recent female’s liking, this reduction and coldn thomas sabo jewellery ess, largely to clothes and more to show the women’s boundary of the thomas sabo jewellery charm. In detail, many international brands of rage designers have i thomas sabo price ncisive out that the objects on each shape studs sequence.